The Keystone Foundation is based out of a set of red-orange buildings that cling to the side of a hill, amongst tea plantations and endless shades of green. Walking down the hill, along the road, I have found myself lost, again and again in the depth of greenery. 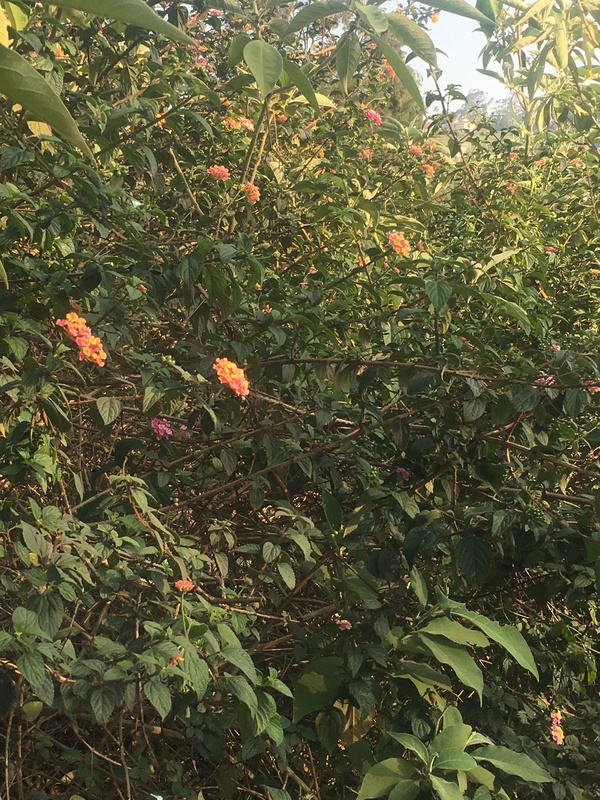 When we first arrived here, after spending weeks in a wintery city, I felt thrilled at the sight of purple and orange flowers, towering trees, and wide shrubs along the roads. It was a sweet reminder to me that life is a consistent function of our planet and that the greyest of winters does not prevent growth. 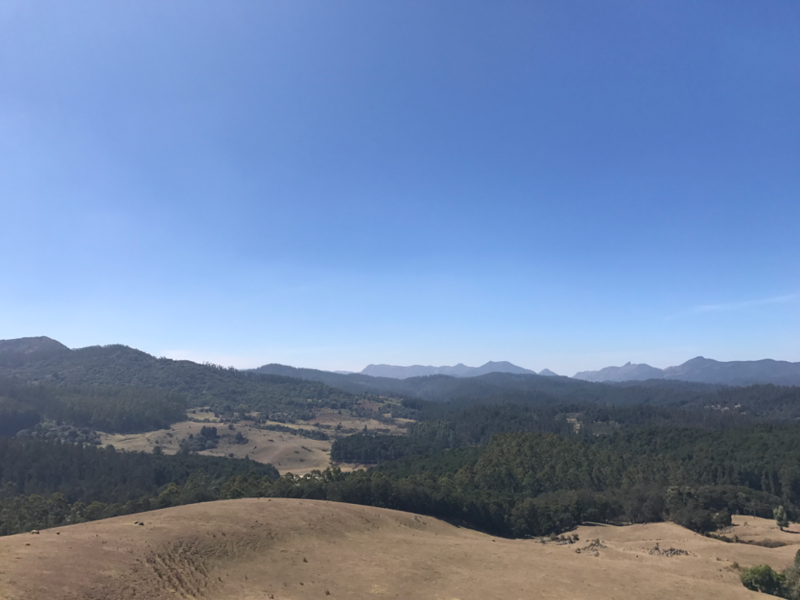 But over the past week, as we have spent more time with the ecologists and experts of the conservation team and explored the landscape of the Nilgiris Biosphere Reserve, I find myself examining the beauty around me. Naming and recognizing the plants around me—the scotch brush, the lantana, the eucalyptus—has reminded me of the history of this country and informed me of the profound challenges that this landscape faces. The marangal (trees), poogal (flowers), puthargal (shrubs) I admired are invasive species. With a more layered lens in hand, I am starting to understand that these plants are also symbols of colonialism, globalization, and suffocation of the Indian “way”. We saw the eucalyptus plantations sucking up the water of Nilgiris wetlands and lantana consuming the open space on the native forests managed by Keystone in Happy Valley in Kotagiri. What I believe to be beautiful greenery meant so much more to the people who have lived here. The impacts of colonialism and misguided federal policies on wildlife and human communities are astonishing. Hearing the complexities of the landscape, which we are trying to understand, has furthered my internal confusion, nerves, and reservations about being in Kotagiri. In the deepening of my understanding of the greenery around me, I have begun to reflect back on my own presence here as an “invasive species,” an “outsider” of sorts. In my lifetime as a student, I have been encouraged to drink in knowledge, to collect information, synthesize it, and use the little bits of what I know to influence the world around me and make decisions. I have experienced learning in a privileged way, where my white skin allowed me to fit in with teachers’ expectations and my heritage instilled me with a desire to work hard so that my parents wouldn’t have to. I got to slide through school, with the same aesthetic ease that allows the purple lantana flowers to take over, unnoticed. We are both products of a post-colonial world and I find my personal story represented in the invasive species of the Nilgiris. I am constantly wondering how much of my learning is overshadowing another species, undermining the words of my Adivasi classmates, feeding into the narrative of post-colonial landscapes. However, the classroom here works differently, and though I am as thirsty as the eucalyptus trees, I find myself trying to share, to connect, and to truly cross boundaries with my peers. 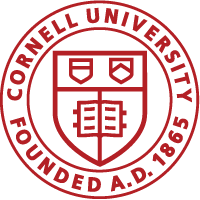 We, Cornell students and Keystone students, are here. We are present every moment, learning from each other and our contexts and bringing our full selves into the process of sharing and critically analyzing this world. And despite the conflicts I face within myself, I am grateful to be able to communicate as honestly as translation will permit with people who should be seeking to uproot the influence I have on this landscape.